What is an official translation? | INVISIBLE Translation Inc.
Home » What is an official translation? In Quebec, an official translation is a written document prepared by a certified translator who faithfully reproduces, in another language, a document issued by a recognized authority. Since any document issued by an official body has an authentic and formal nature, it may only be translated by a government-approved translator, who has the power and legitimacy to give it the same authenticity as the original document. Many adjectives are used—often incorrectly—to describe an official translation: sworn, attested, authenticated, certified, legal and notarized, to name but a few. Let’s set the record straight, once and for all. To be sworn means taking or administering an oath, the oath being a solemn declaration or commitment, which may or may not be pronounced in public. Since only a person can take an oath, the expression “sworn translation” is incorrect. An attestation is a declaration or evidence that a thing or fact is certain or real. A translated document, being physical and tangible, is a palpable thing. Therefore, a person can attest to its existence. The purpose of authentication is to render something authentic or recognize it as being authentic. For example, a registry office authenticates marriages, births and deaths, while an expert authenticates artefacts or works of art. In the case of translation, it is the original document, the one that needs to be translated, that could be subject to authentication. 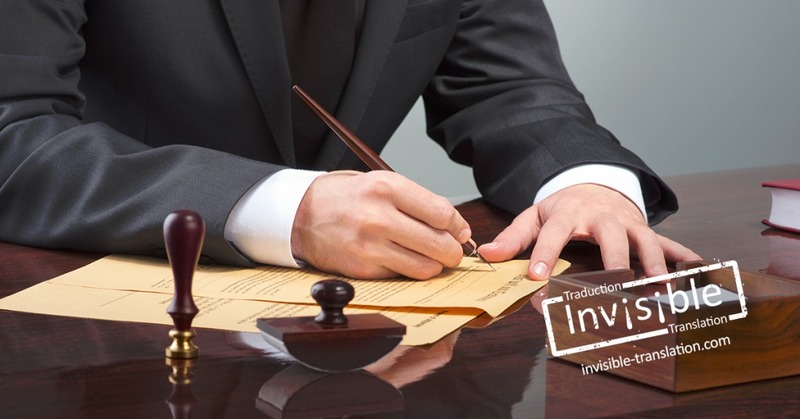 When it comes to translation, certification is designed to attest to the true and official nature of the translated document by affixing a legitimate mark, such as a signature or a seal, to it. Once the translation has been produced, the certified translator certifies it using a seal or official mark, thereby resulting in a certified translation. The adjective legal refers to the law and its practice, or proceedings before the courts. A legal translation is often provided by a lawyer-translator who has extensive knowledge in the field of law. This type of translation includes, but is not limited to, laws and bills, contracts and other legal documents. Sometimes an authority requires that a translation be notarized after it has been certified. In this case, a notary must in turn certify the translated document by affixing their seal or mark to confirm its validity. In most cases, a translation must be notarized before being submitted to a foreign government. The Ordre des traducteurs, terminologues et interprètes agréés du Québec (OTTIAQ), which supervises certified translators and translation practice in the province, allows all members to set their own rates. The cost of an official translation varies depending on the nature of the document to be translated, the complexity of the information it contains, the layout of the content, the number of pages and the deadline for completing the work. Additional costs may be involved for documents of a legal nature or documents that must be notarized. After checking that the selected translator is in fact listed in OTTIAQ’s Member Directory, you must provide the document to be translated either by email, mail or in person. You must give the translator a reasonable amount of time to reproduce the structure and formatting of the original document, translate it, seal it and return it to you. The translator must also provide a declaration that the document was translated consistent with accepted practice and that it is a certified true translation of the original. The translator will thus give you the signed, sealed declaration, a photocopy of the original signed, sealed document, and the official translation, also signed and sealed. Send us the document you would like to have translated, as well as your contact information, and we will contact you shortly to discuss your request in further detail. You can also call us toll-free at 1-833-436-6331 to discuss your needs.